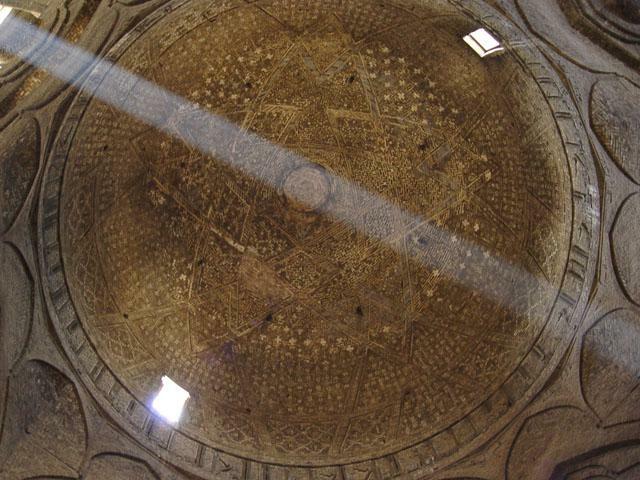 The North Dome of the Friday Mosque of Isfahan is an architectural masterpiece. Built under the patronage the Saljuq courtier Taj al-Mulk, antagonist of the wazir Nizam al-Mulk, in 481/1088-1089, during the reign of Malik Shah. The dome includes a variety of inscriptions, but here I want to concentrate on the choice of some names of God inscribed on the panels of the zone of transition. I think that they can shed light on the function of the domed chamber, which has long been debated among scholars. Whereas the function of the southern dome of the mosque, built by Nizam al-Mulk presumably a few years before its souther counterpart, is pretty clear and related to the mihrab zone it covers, the North Dome and its actual function has long been debates. In the description provided by ArchNet we read that “because of the dome’s initial freestanding position, many historians have speculated that it served as a private prayer space, a women’s mosque, or even a library”. Sheila Blair, in her valuable survey of Islamic Inscriptions in Iran, points out that considering the arrangement of the inscriptions we can postulate how a person was supposed to access and use the building (p. 166). The first comprehensive attempt to define the function of the domed space was made by Sauvaget. In his study he stated that it was quite uncertain that the chamber was meant as a library and that it couldn’t be a place of worship, “as the building lacked a mihrab“. The sumptuousness of the room and its architectural character made him think that the chamber was related in some way with the sovereign. “He concluded that the north dome was the place where the sultan stood before moving on to his religious duties”, as Sheila Blair writes (p.166). Anyway, this assumption lacks of contextualisation: we do not have any evidence for religious ceremonial during the Saljuq rule. Sheila Blair suggests that Barbara Finster’s analysis of the domed chamber as the seat of the mazalim court can be held as plausible. The mazalim court was the lay counterpart of the religious court and mainly dealt with the settlement of litigation and execution of estates and property. Whereas Sheila Blair only concentrates solely on the Qur’anic inscriptions to prove this function as a mazalim, I think that also the nature of the 32 chosen names of God inscribed can give us a prove of the function. The nature of some of the 32 names of God inscribed in the transition zone of the dome can be divided, according to my analysis, into three main groups, describing God as sovereign, as judge and as wise. The description of God as sovereign is clear particularly in three names: al-malik – the King; al-haliq – the Creator; al-qadir – the All-Powerful. The idea is also to be found in the qur’anic quotation as a whole and particularly in the constant employment of words containing the root m-l-k (=to rule, to command). God seen as wise and informed judge is clear in the names: al-diyan – the Judge [even if not commonly part of the canonical 99 Names of God]; al-hakim – the All-Wise; al-haqq – the Truth; al-muhaymin – the Controller/the Witness; al-khabir – the All-Aware; al-basir – the All-Seeing. In these cases, the names of God seem specifically connected with a court environment, in which he’s both the Judge and the Controller (or the Witness). The theme of the divine benevolence is to be found in the following names: al-rahman – the Compassionate; al-mujid – the Answerer; al-salam – the Peaceful; al-karim – the Generous; al-mughni – the Enricher; al-nasir – the Helpful; al-ghafur – the Much-Forgiving. All these attributes are highly suitable to the context of a court in which the sultan was actually the judge. Being the sultan the “executive power”, the inscriptions with the names of God function as reminders both for the sultan and for the commoners: God is the ultimate Judge, as he is also the Creator and the Sovereign of the world. He has a reassuring position in this context: he is Wise and Benevolent, Forgiving and Generous. As Sheila Blair points out, the general tone of the inscriptions underlines such a function for the domed chamber. Here, what I wanted to point out, is that actually not only the Qur’anic inscriptionscan give us hints regarding the function and context of the building in which they’re inscribed, but also less considered inscriptions, such as the choice of the names of God. S. Babaie (with R. Haug), “Isfahan x. Monuments (3) Mosques”, Encyclopædia Iranica, XIV/1, pp. 20-33; available online at http://www.iranicaonline.org/articles/isfahan-x3-mosques (last accessed Sep 30, 2014). B. Finster, “The Saljuqs as patrons”, in R. Hillenbrand (ed. ), The Art of the Saljuqs in Iran and Anatolia. Proceedings of a Symposium held in Edinburgh in 1982, Mezda Publisher, Costa Mesa 1994, pp. 17-29. L. Gardet, “Al-asma’ al-Husna”, in The Encyclopaedia of Islam, Brill, Leiden 1986, vol. I, pp. 714-717. J. S. Nielsen, “Mazalim”, in The Encyclopaedia of Islam, Brill, Leiden 1991, VI, pp. 933-935.